Do Lemons or Vinegar Kill Fleas? Natural products that replace harsh or toxic chemicals hold a certain appeal. However, even if a product is natural, it is not automatically safe to use on dogs. While lemon and vinegar products seem ordinary enough to use without concern, they might cause irritation, illness or even death in some pets. 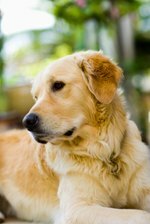 In addition, although they may deter fleas, they typically do not kill them. Make a natural flea collar by placing several drops of essential lemon oil on a fabric dog collar or cloth bandanna. The lemon oil fragrance will repel fleas. Quarter one or two fresh lemons. Add lemon quarters to 1 quart of water. Boil lemon quarters for 5 minutes. Steep lemons in water for approximately 8 hours or overnight. Spray this product over the dog's entire body once or twice a day, taking care to avoid her eyes, nose and genitalia. This solution can be kept refrigerated for up to a week. Internal Use: Add a small amount of raw apple cider vinegar to your dog's water daily. Doing so will cause your dog's blood to taste unpleasant to the fleas and they will stop biting her. External Use: Mix a 50 percent solution of water and raw apple cider vinegar. Soak your dog's fur with this solution. Allow to dry naturally. Comb your dog's coat with a flea comb, if desired. Lemon-based and vinegar-based products are both acidic in nature. It is possible that frequently applying these products to your dog or offering significant quantities in your dog's water might cause irritation of the skin or stomach. Always use caution when using lemon-based or vinegar-based products and increase the quantity or frequency of use gradually to ensure no damage occurs. It has been suggested that the chemicals d-limonene and linalool, the flea-killing ingredients found in lemon-based products, especially essential oils, might be toxic to some dogs and cats. If your dog shows any sensitivity to small amounts of these products, stop using them. Any reaction that is greater than mild irritation is cause to bring your dog to the vet for treatment.